Hairy Mountain Folk: Cooking, Treetops style! 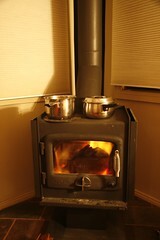 It has finally got cold enough for us to justify lighting our little wood stove, and it's sooooo nice. The weather over this long weekend hasn't been the best, so instead of being out in the garden, we're spending more time indoors reading, cooking and faffing. Apart from the fact that the fire heats the house so deliciously, it's also handy to cook on. Feels very 'Little House On The Prairie' to cook on the fire. I like. All I need now is a gingham pinnie and a possie of rug rats... Phil wants twelve of them. I've told him conjugal rights cease after four. He's pondering this proposal.